Jealousy (as Britain’s Queen Alexandra famously said 102 years ago) is the source of so many problems in life. Well, you don’t need me to tell you that – or that there is plenty of jealousy in the world. And, evidently, there was plenty of it around in the Gospel story we just heard [Mark 9:38-43, 47-48] – as evidenced by the disciples’ angry reaction to the unnamed “someone” they had caught casting out devils in Jesus’ name, as well as in the earlier Old Testament story highlighting Joshua’s jealous reaction to Eldad and Medad prophesying in the camp. I think we can all recognize some of ourselves in the behavior of both Joshua and Jesus’ disciples. Jesus’ startling response – like that of Moses before him – seems to go against what we can all recognize as one of our most ordinary and deeply embedded patterns of human behavior. As we have been hearing now for the past several Sundays, Jesus has been instructing his disciples for some time about what was going to happen when they got to Jerusalem – and what that experience should translate into in terms of their own attitudes. Yet the impression one gets over and over again – in the Gospels as in ordinary life, when things get repeated over and over, there is usually a reason, an instructional purpose – the impression one gets is that the disciples just don’t get it. On the contrary, we see them again focused on themselves, on being insiders, on being important members of a prestigious and powerful inner circle – powerful enough, presumably, at least to make it through life with both hands, both feet, and both eyes intact! Like members of any adolescent clique (or any adult one), the disciples seem obsessed with distinguishing who’s in from who’s out, who’s up from who’s down, who’s rich from who’s poor, who’s smart from who’s dumb, who dresses well from who doesn’t, who’s cool from who’s not - and equally obsessed with having it all without having to sacrifice anything, let alone a hand, a foot, or an eye. Sound familiar? Of course, in the world we human beings have built for ourselves, our world works best by building barriers, something we are forever doing at every level. That’s who we are. It expresses what we want and determines how we act – in our relationships, in our careers, whatever. The good news of the Gospel is that by his life (and above all by his death) Jesus has liberated us from this deep-seated, but ultimately enslaving and self-destructive need to be forever comparing ourselves, to be forever in competition, to be forever keeping score, counting our possessions and calculating our coolness. Jesus challenges us to free ourselves from this unending universal human obsession about ourselves, about us. And, of course, all those things we want for ourselves all come in limited quantities. That’s presumably a big part of their appeal. To the extent that I get a lot, someone else gets less, a little, or nothing at all. That’s the essential reality of economic and political life, which is why economic and political life are so largely about conflict, because the reality is that there really is never enough of all the stuff we want – certainly not enough for everyone! And, as the 2nd Reading [James 5:1-6] reminds us, those at the top of the economic pyramid tend to try to guarantee that it stays that way. So the perennial task of economic systems and governments is to figure out how most satisfactorily to allocate all those scarce, limited benefits that we all so desire. The kingdom of God, however, is not like that and has no such limits. It has room enough for all of us. It’s the ultimate (and perhaps the only) genuinely “win-win” situation. But it also entails a completely novel and completely unique notion of what winning means, enabling us to accomplish mighty deeds in God’s name, transforming our “lose-lose” world into something we would otherwise never have been able even to imagine. So, while we would all much rather spend our energy vainly competing to accumulate more hands, more feet, more eyes – tangible ones like wealth, power, and status, and those equally elusive if less tangible ones like affirmation, respect, and love – as if our lives were ever really our own, Jesus is challenging us (as only he can) to feel, to walk, and to see our way through life with his hands, his feet, and his eyes – and so to feel, to walk, and to see things his way. Homily for the 26th Sunday in Ordinary Time, Immaculate Conception Church, Knoxville, TN, September 30, 2012. Jesus said, "I have observed Satan fall like lightening from the sky" [Luke 10:18]. At the awesome age of nine, it fell to me to pick a confirmation name for myself. I chose Michael.I encoutnered some unexpected family opposition on the odd grounds that Michael was not an Italian name. Michael Corleone and The Godfather movie were still 15 years in the future, but you'd think that surely somebody should have heard of Michelangelo Buonarotti. Well, I won that battle, and on September 22, 1957, Bishop Cornelius Van Lierde addressed me (in Latin, of course) as Michael as he signed me "with the sign of the cross" and confirmed me "with the chrism of salvation" (as the sacramental form then in use put it). And then we went home and had a turkey dinner, and I got presents. Why Michael? For a wimpy, somewhat nerdy kid, Michael seemed to sound a suitably macho note. If I'd been British - or at least English - I might perhaps have picked George for the same reason. What sealed the deal for Michael for me was the prayer we used to recite regularly in those days after every Low Mass: Saint Michael the Archangel, defend us in battle. Be our protection against the wickedness and snares of the devil. May God rebuke him, we humbly pray; and do you, O Prince of the heavenly host, by the divine power of God, thrust into Hell Satan and all the other evil spirits, who prowl about the world, seeking the ruin and destruction of souls. Just the sort of saint a wimpy kid would want to identify with in a a tough, bullying world! No wonder ancient Israel - a small kingdom at best, or even worse a collection of displaced persons, surrounded by powerful ancient empires, surrounded bu bullies on every side - sought Michael's protection: At that time there shall arise Michael, the great prince, guardian of your people. It shall be a time unsurpassed in distress since nations began until that time. At that time your people shall escape, everyone who is found written in the book [Daniel 12:1]. No wonder the Church in turn has seen Michael as the great warrior angel against Satan! Thus, the reading at this morning's Mass: Then war broke out in heaven; Michael and his angels battled against the dragon. The dragon and its angels fought back, but they did not prevail and there was no longer any place for them in heaven. The huge dragon, the ancient serpent, who is claled the Devil and Satan, who deceived the whole world, was thrown down to earth, and its angels were thrown down with it [Revelation 12:7-9]. Whether it's the historically insignificant personal struggle of a wimpy kind in the Bronx, or the historically decisive story of Israel, or the cosmic battle between the Kingdom of God and Satan, the struggle seems ongoing: But woe to you, earth and sea, for the devil has come down to you in great fury [Revelation 12:12]. But, at least in that ultimate conflict, whatever the costs and struggles along the way, the final outcome is clear: for he [the Devil] knows he has but a short time [ Revelation 12:12]. 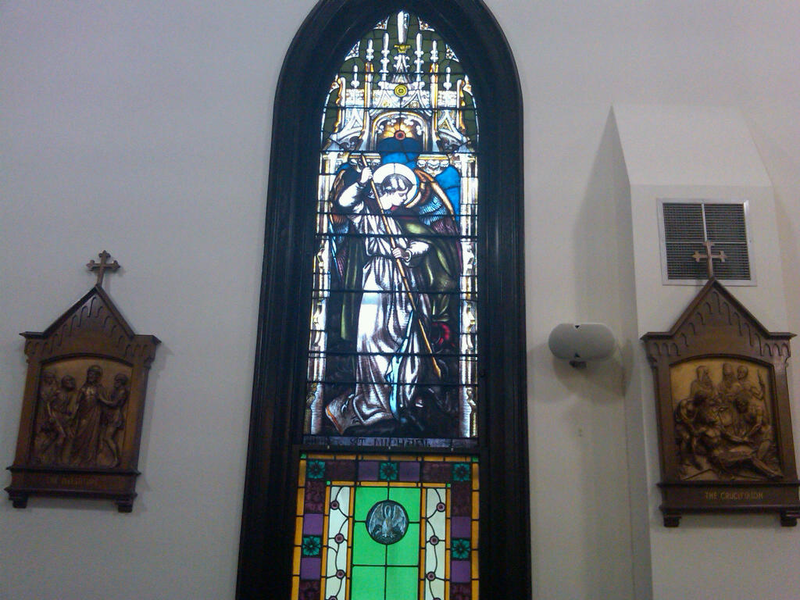 Angels are incorporeal spirits, but we portray them as men - Michael as a warrior defeating the dragon/serpent (as seen for example the attached phjoto of a window in my church). As we struggle to navigate our way through this perilous, problem-filled life, and as the Church struggles to hold its own against all the threating power of the world, we take comfort in the protection of the multitude of angelic spirits who share the universe with us and find courage in the confidence that the decisive battle has already been one on our behalf. Unlike the United States, Established Churches have long been a feature of European societies. Some states - the United Kingdom, Denmark, Iceland, and (until earlier this year) Norway - have official state Churches under some degree of direct government authority. Others have moved away from formal Establishment in that sense, but continue to provide financial support for one or more Churches through various types of "church taxes." Some version of this is the case in Austria, Denmark, Germany, Italy, Finland, Seden, and Switzerland. In the German case, the 1919 Weimar Constitution and its 1949 successor make provision for such a tax to be paid by Church members - both Catholics and Protestants - paid to the State and then passed on by the State to the Church of which the taxpayer is officially a member. In Germany, where this has long been people's customary way of supporting their Church, some 70% of the incomes of Churches come from these taxes. Since there is no officially Established Church in Germany, the taxes are paid only by those who are Church members. Those who are not members of any Church do not pay. German law allows one to remove oneself from one's Church (and hence from the Church's Tax rolls) by a formal act of legally declaring that one is leaving the Church. This simple, easy-to-understand system is now in the news because of a 2007 lawsuit in which the plaintiff maintained he should be entitled to continue participating in Catholic Church activities (including receiving the Sacraments) despite having legally left the Catholic Church in order not to pay the tax. The Court's verdict came yesterday and sided with the Church. This came less than a week after the German Bishops had decreed that those who had formally left the Church were, as a result of that action, exactly what in fact they were legally claiming to be and had legally declared themselves to be - no longer members of the Church - and hence no longer eligible to participate as members in the Church's life. In the words of Freiburg's Archbishop Robert Zollitsch, President of the German Bishops' Conference, it is a question of "the credibility of the church's sacramental nature. One cannot be half a member or only partly a member. Either one belongs and commits, or one renounces this." Needless to say, some voices - one is tempted to characterize them as "the usual suspects" - are now being raised in protest. Obviously a Church Tax is not the only way to support the Church, and perhaps it is not the ideal way. But that is really a separate issue - a legitimate subject for discussion, but one entirely separate from the principle at issue here. The central issue - as Archbishop Zollitsch clearly expressed it - is what it means to be a Church and a member of a Church. One of the most problematic developments in contemporary language about Church is the use of the expression "Institutional Church" - which seems to me to be an ideologically inspired choice of words which implies or suggests that there is some other experience of Church apart from its communal life. Such a suggestion may well be very appealing in our hyper-individualistic society. But there is only one Church, which exists - as it is meant to - in the world. The Church is not some ethereal, "spiritual" bond which is only as serious or as frivolous as individuals care to make it at any particular moment in time. It is a real relationship spanning both space and time - uniting each local church with every other local church in the one Universal Church and each generation with every other generation of faithful. It was precisely this understanding of the Church as more than just an ad hoc association of individuals that so powerfully attracted a young Isaac Hecker to the Catholic Church in mid-19th-century America: “When, in 1843, I first read in the catechism of the Council of Trent the doctrine of the communion of saints, it went right home. It alone was to me a heavier weight on the Catholic side of the scales than the best historical argument which could be presented. … The body made alive by such truths ought to be of divine life and its origin traceable to a divine establishment: it ought to be the true church. The certainty of the distinctively Catholic doctrine of the union of God and men made the institution of the church by Christ exceedingly probable.” (“Dr. Brownson and Catholicity,” The Catholic World, November 1887). The benefits of being part of the Church are many - benefits both short-term and long-term - benefits one is inclined to label "infinite." Not being willing to help pay the monthly bills seems like a poor reason - a cheap reason - to give all that up. An article in the current (September 22-28) issue of The Economist suggests something may be changing in our culture's addiction to the automobile. "Seeing the Back of the Car" begins predictably enough, reminding us how integral cars are to modern life. Cars account, we are told, for 70% of all non-foot travel in the 34 OECD (Organization for Economic Cooperation and Development) countries, and America is "stil the most car-mad country in the world." But something surprisingly different suddenly seems to be developing. In fact, while inevitably exacerbated by the recession, a contrary tendency appears to have begun even before the recession: "After decades when each individual was on average travelling farther every year, growth per person has slowed distinctly, and in many cases stopped altogether." One reason for the apparent decline is that the current retiree generation is the first in which most people drove, which means that newer drivers are now merely replacing older drivers, rather than adding to the total number of drivers. Even more significantly, younger people are getting licenses later than they used to, and the percentage of younger households without cars has increased. Unemployment is obviously a factor, but even employed American youngsters are driving both "less far and less often." Car use remains stable in rural areas - "where driving still offers freedom and convenience." But car ownership is declining in urban areas, while "city living is on the rise." In the U.S. "13% of people in cities of more than 3m people have no care while only 6% in rural areas live without one." Perhaps the most intriguing development, however, is the relationship the article posts between internet use and a decline in driving. Younger people who spend time on the internet are not only less likely to drive a lot but even less likely to get a license: "young people increasingly increasingly view cars as appliances not aspirations, and say that social media give them the access to their world that would once have been associated with cars." And, of course, people are shopping more on-line, which means less driving to shop. All of this bodes well for whatever lies ahead. Perhaps, it may be too late to make much of a perceptible difference environmentally. The climate-change train has clearly already left the station, and a world climate train-wreck may be inevitable. But if even some of the social dysfunctions the 20th century's destructive addiction to the automobile can be reversed that would be a positive step, however modest, toward an improved qualilty of urban living and a revival of local community life. Of course, the Gospel only hints at all that. It tells us that when Jesus asked what they had been arguing about, they were suddenly (and suspiciously) tongue-tied. And Jesus, ever the teacher, took the opportunity to teach them a lesson. Actually, this was the second time Jesus had tried to teach them what lay ahead. But they failed to understand. In a world without power-point presentations and other such gimmicks, Jesus employed a child as his instructional aide. Children induce all sorts of reactions in people. A baby is a sure attention-grabber in any gathering. In our society, children are considered cute, innocent individuals, to whom we are expected to react positively and benevolently. Forty-one years ago, as a City College undergrad in New York, I had a work-study job which one day involved my attending a meeting at a Head Start facility on the Lower East Side, in what would then have been a very depressed neighborhood. One of the pre-school kids showed up as usual, not knowing that the place was closed that day, prompting someone to comment. “That’s a smart kid! He knows he’s better off here than at home!” How smart or not he was I can’t say, but what I took away from that was that, smart or not, he was still just a child and so was dependent on adults’ schedules – dependent and hence powerless. His powerlessness was in part the powerlessness of the poor, of course; but being a child made his powerlessness that much more so. Even rich children, after all, are ultimately dependent on someone else to exercise power on their behalf. No wonder they found him hard to understand! It seems being a disciple means more than merely listening to Jesus’ words and possibly preaching them to others. No, it means being led, by him and with him, where he was led. It means leaving behind our perpetual preoccupation with power and status, our aspiration to greatness and accomplishment, our competitiveness with one another and within our own selves - the passions that today’s 2nd reading [James 3:16-4:3] so strongly warns us about, causing us to covet but not possess, to envy but not obtain, to ask but not receive. From middle and high school popularity contests to our national campaigns, it’s all about who’s up and who’s down, who’s in and who’s out. That can be quite frightening, even threatening. Certainly, it scared the disciples. And it scares most of us most of the time, which is why we tend to pass over it as quickly as possible in search of some more “upbeat” message. But ultimately this is the challenge of a Christian life – of all Christians from first to last. That such a fantastic notion as state sovereignty still survived with a lingering patina of respectability fo so long and required such a catastrophic conflict to be suppressed says something, I suppose, about the political and moral limits of the original constitutional compromise. "Both parties deprecated war, but one of them would make war rather than let the nation survive, and the other would accept war rather than let it perish, and the war came. "One-eighth of the whole population were colored slaves, not distributed generally over the Union, but localized in the southern part of it. These slaves constituted a peculiar and powerful interest. All knew that this interest was somehow the cause of the war. To strengthen, perpetuate, and extend this interest was the object for which the insurgents would rend the Union even by war ..."
In the traditional Roman Calendar, September 19 was long observed as the feast of Saint Januarius (San Gennaro, in Italian), Bishop of Benevento, martyred c. 305 along with six others - the deacon Festus, the lector Desiderius, the deacons Sosius and Proculus, and the laymen Eutyches and Acutius - during the persecution of Emperor Diocletian. In the current calendar, only Januarius is commemorated, and all mention of his companions seems to have evaporated. For centuries, San Gennaro's body has reposed in the Cathedral of Naples; and, as patron of that city, he continues to be invoked for protection from fire, earthquakes, and the ever-present threat from Mount Vesuvius. In Naples on this day, a silver bust containing the head of the saint and a glass reliquary containing a solidified sample of the saint's blood are exposed for veneration. Led by a group of women, called zie di San Gennaro, the people pray for the famous miracle of the liquefying of his blood. When that happens, the ritual announcement is made, Il miracolo e fatto. The Te Deum is then sung, and the reliquary is made available to be kissed by the people. In the early 20th century, the massive wave of Neapolitan immigrants to America made devotion to San Gennaro a popular part of immigrant Italian life in New York City's Little Italy. The still popular street festival originated on Mulberry street on September 19, 1926. The one-day festa eventually expanded to today's 11-day street fair and a major tourist attraction - New York's biggest and most famous street festival and a great place to go for sausage and zeppole - a combination carnival and charity fundraiser. Operated by a not-for profit community organization, the contemporary festa distributes donations to various charitable organizations. Today's money-spending, sausage and zeppole consuming tourists may know little and care less about San Gennaro and miraculous protection from volcanic eruptions, but even now the festa still features a religious procession on the actual feast day, an authentic expression of an immigrant community's heart and the spiritual strength that sustained the struggle of the Italian immigrant experience. In 1850, there were 1039 Italian-born New Yorkers. That number peaked in 1930 at 440,250 - including all my grandparents and several of my aunts and uncles. As strangers in a foreign land, Italian migrants faced all the challenges - and opportunities - inherent in immigration. As Catholics, they faced the added challenge of being perceived primarily as a problem by the predominantly Irish ecclesiastical establishment. As much as anything else, the New York Italian street festivals - not just San Gennaro, but Sant' Antonio, San Rocco, and Our Lady of Mount Carmel - celebrated an alternative quality of community experience. While the establishment lamented what the immigrants didn't do, the festa demonstrated who they were. Believe it or not, today (September 17, the 225th anniversary of the signing of the U.S. Constitution by 39 of the 42 delegates to the Constitutional Convention, representing 12 of the 13 states) is "Constitution Day" - technically "Constitution Day and Citizenship Day." It's easy, of course, not to believe it, because, except perhaps in schools, one is not likely to hear much about it. On the other hand, we now have so many days, weeks, and months to placate so many demanding special interest groups that it's just as easy to believe that we have a Constitution Day, whether or not anyone knows or cares about it. For years, the Constitution's anniversary had been titled "Citizenship Day." In 2004, an amendment to an Omnibus Spending Bill changed the name and mandated that all publicly diunded educational institutions offer some educational programming on that day on the history of the Constitution - a requirement the DEA applied the followign year to all schools receiving any kind of federal aid. I haven't a clue what may go on in schools on this day. Given the sad state of American education in general, the even sadder state of historical knowledge in our country today, and the virtual abandonment of civics instruction, I suppose almost any "Constitution Day" educational program might be for the better. So what needs amending in our constitution today? To my mind the two major flaws in the Constitution are so fundmantal as to be hopelessly beyond repair. The Constitution established a "separation of powers" system rather than the British-style "parliamentary" system now found in most successful democracies. The combination of "separation of powers" and powerful political parties makes governing difficult at best. When different branches are controlled by different parties ("divided government"), gridlock is often the likely result. The other, largely irreparable flaw is federalism - the retention of states as independent semi-sovereign entities which limit the national community's ability to address national problems. The bizarre practice of the judicial branch nullifying the popular will by declaring acts of Congress unconstitutional is not in the Constitution. It's a power the Supreme Court gave itself early on (Marbury v. Madison, 1803). Since everyone can find some judicial decisions he or she agrees with, there will never be sufficient consensus to do away with judicial review of congressional acts. But a consensus could be developed around some less bold reforms - for example, amending the Constitution to give justices fixed terms (say 10 years). One consequence of the judiciary's historical power grab has been the selective "incorporation" of the Bill of Rights and, along with that, an increasingly secularist reading of the 1st Amendment's Establishment Clause. A constitutional amendment incorproating some of the provisions of 1993 Religious Freedom Restoration Act, for example, would be beneficial. And, of course, an amendment overturning the infamous 1973 Roe v. Wade decision (much like the 14th Amendment which overturned Dred Scott) would be welcome. Realistically, however, while pro-life sentiment is on the rise and there is widespread support for restricting the evil practice of abortion, the country remains, I think, still very far from the kind of consensus a constitutional amendment would require. On the five Sundays of September this year, the 2nd Reading at Mass is taken from the Letter of St. James, which contains some of the most significantly challenging moral sentiments in the the New Testament Epistles. Last Sunday, for example, the reading contained James' famous condemnation of making distinctions in favor of the rich. For if a man with gold rings and fine clothes comes into your assembly, and a poor person in shabby clothes also comes in, and you pay attention to the one wearing the fine clothes and say, "Sit here, please," while you say to the poor one, "Stand there," or "Sit at my feet," have you not made distinctions among yourselves and become judges with evil designs? [James 2:2-4]. James was apparently citing situations that might arise within the Church community itself - and presumably (since he took the time and trouble to address them) situations that actually did arise in Church life. Does anyone doubt that particular problem is still with us? It seems safe to say that this pervasively universal mindset continues to be one of the greatest actual challenges to living an authentic life of faith in our time and place no less than in Adam Smith's, no less than in the era and world of the New Testament. James did more than highlight one particular, if pervasive, moral problem, however. This morning's reading continues last week's theme: If a brother or sister has nothing to wear and has no food for the day, and one of you says to them, "go in peace, keep warm, and eat well," but you do not give them the necessities of the body, what good is it? [James 2:15-16]. In doing this, however, James expands on these specific examples to remind us that living an authentic life of faith is precisely the point of faith itself. What good is it, James asks, if someone says he has faith but does not have works? [James 2:14]. With few words and simple, straightforward examples that any reader (or hearer) of the Epistle could immediately comprehend, James challenges us to examine our lives as actually lived, and the standard for that examination of conscience is whether or not and how our profession of faith penetrates the wider world by the way it permeates our individual and communal Christian lives. All of which brings us to citizenship. Faith does not, of course, prescribe the particulars of public policy, let alone partisan party platforms. Most matters of policy are what we, somewhat imprecisely but conventionally call, contingent questions. What faith does prescribe, however, is a certain intentionality about how we live our lives. A significant part of human life is lived privately - individually, the the family, in various modes of private association. Most of us in our private lives, more or less most of the time, make at least an attempt to demonstrate our faith in our works. Undoubtedly the directness of private relationships, there face-to-face Gemeinschaft character contributes to that reality. A comparably significant part of life, however, is lived publicly, and that is the arena of citizenship. Who we are together, publicly, is what we call government. and how we live together as government is what citizenship is about. And who we are and how we live seriously as citizens is how we demonstrate our faith in our works in the public dimension of our lives. Having brought them to that pagan, worldly place, Jesus, we are told, paused there to ask his disciples what was maybe the most important question they had ever yet been asked - the question that in some form anyone who purports to be a Christian must also ask and answer. This episode comes at the midpoint of Mark’s Gospel, more or less at the midpoint of Jesus’ public life. It also seems to be something of a midpoint in the disciples’ own experience – in their gradual growth in understanding Jesus’ true identity - their understanding of who he is and of what who he is must mean for them. Jesus had first asked: Who do people say that I am? And, just as one would expect if one were to ask that same question today, Jesus got a variety of different answers. Then as now, Jesus meant different things to different people, all of whom naturally tried to fit him into their already existing ways of thinking. Jesus then revised his question to focus directly on his special group of followers: But who do you say that I am? Peter, already anticipating his role as leader of the Church, answered for them all – and for us all – You are the Christ (in other words, the Messiah, the One anointed by God). What a wonderful, inspiring insight – one for which Peter has always been remembered and honored! If only the story had ended there! But the conversation continued; and, as the rest of the story shows, Peter did not yet really understand what it actually meant that Jesus is the Christ, because he didn’t yet really understand the kind of Messiah Jesus actually is. So, Jesus responded to Peter’s initial insight with the seemingly strange command not to tell anyone about him, followed in fairly short order by his even more surprising - shockingly stern - reproof to Peter: Get behind me, Satan. You are thinking not as God does, but as human beings do. Yet, why should any of this really surprise us? Like Peter, don't we all want Jesus to be the kind of Messiah that we want? Don't we all want to see him through a lens of our own imagining, thinking not as God does, but as human beings do? There’s really nothing so surprising about that at all. Every age and every culture, that has concerned itself with Jesus at all, has done the same. So has every artist and every author, who has portrayed Jesus. And, to be fair to Peter, there was after all nothing in what he had been taught that would have led him to expect – let alone want – a Messiah would suffer greatly, be rejected, and be killed. But this was, after all, just the midpoint of the disciples’ journey – a journey first into a recognition that Jesus is the Christ and then a fuller understanding of what that actually means – a journey that will take them with Jesus to the cross and then to an empty tomb. The first several centuries of the Church’s history were characterized by a series of serious quarrels and debates about who in fact Jesus is – in relation to God and in relation to us - and exactly what all that really means for us. The complex formulas we recite every time we say the Creed reflect in part the way those disputes were eventually resolved. We today are the beneficiaries of those quarrels and debates and the Creeds they created in order to facilitate our fuller understanding of Jesus. Every time we recite the Creed, especially when we do so together, as we do, for example, when we say the Nicene Creed every Sunday at Mass, we acknowledge who Jesus is and we commit ourselves to make the same journey in faith that Peter and the disciples had to make - with Jesus to the cross and then to an empty tomb. Who do you say that Jesus is? Who do I say that Jesus is? Who do we together say that Jesus is? He constantly asks that question of each of us individually and of all of us together – not because he is looking for a novel answer (Christianity is about fidelity not creativity), but precisely because he has already answered it for us with his cross and resurrection. Not that long ago, when the U.S. was busy abandoning its long-standing ally in Egypt (and a reliable collaborator for Mideast peace) in order to get "on the right side of history," there were any number of warnings about how the so-called "Arab Spring" was as likely to play out as an "Arab Winter." Now - in an eerie reminder of what happened decades ago in Iran after the U.S. had abandoned another ally there - the U.S. Embassy in Cairo has been attacked by a mob of violent vandals. Unlike what happened the same day in Libya, where a U.S. 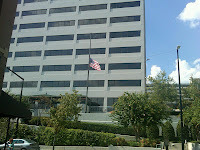 Ambassador and 3 other American personnel were murdered, the Cairo attack seems to have been more symbolic than serious. On the other hand, unlike Libya, where the government behaved like a civilized government and denounced the attack, the new President of Egypt ominously did not do so - preferring instead to suggest the U.S. should get into the movie-censoring business. I have not taken the time to watch the controversial YouTube video that supposedly set off the violence in Cairo, nor have I any particular interest in doing so. Films that denigrate and ridicule religion generally do not appeal to me - any more than other examples of such "art" which have disgraced our country in recent decades. Such "art' rightly invites outrage (although the outrage tends to be somewhat selective, depending on which religion is being insulted). However, apart from propaganda films produced by the government, move-making is a private business int he U.S. One of the consequences of living in a free society, with freedom of expression, is that vulgar, offensive, outrageous "art" will likely be produced. One is free to denounce such "art" and boycott it (and companies that invest in it), but one cannot righty expect the U.S. Government to prevent it (as middle-easterners with no real experience of a genuinely free society might assume). Of course, while proudly professing its identity as a free society, the U.S. Government rightly should dissociate itself from anti-religious propaganda - as the Cairo Embassy staff apparently did just before the attack on the embassy. A certain presidential candidate, trying to capitalize politically on a terrible event, inaccurately called that an "apology." Call it what one will, it has long been the policy of the U.S. Government to dissociate itself from the odious behavior of particular private citizens, when such behavior tarnishes America's image and damages our relations with other nations. After 9/11, President George W. Bush seemed to go out of his way to make clear that U.S. policy was not hostile to any world religion. The U.S. has real enemies in the Middle East (and only one real friend). All the more reason, therefore, to make distinctions where distinctions need to be made and to focus on who our enemies actually are. And, of course, to get one's fact right before engaging in campaign polemics. One of the multitude of greater and lesser differences I experience living where I do now, as opposed to where I used to live, is that September 11 now comes and goes with much less salience and immediacy. 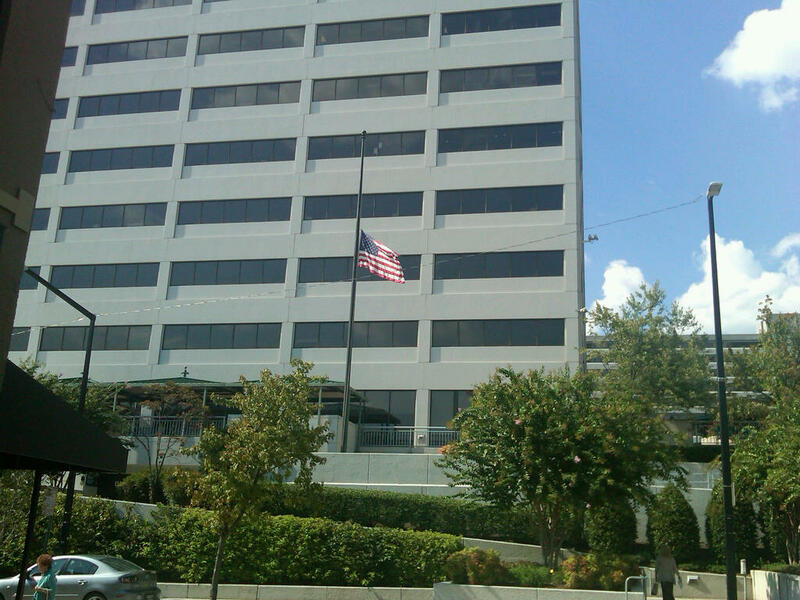 I did celebrate the Votive Mass "In Time of War" today, but otherwise have done little else to mark the occasion (besides take a picture of the flag at half-staff in front of the Tennessee Valley Authority Tower). "Nine-eleven just isn’t what it used to be. Residents of the capital will awaken to what is forecast to be another clear Tuesday morning, just like that one 11 years ago, and they will find that the day that changed the nation is becoming more and more ordinary. "In some ways, this is a good thing: Osama bin Laden is dead, al-Qaeda isn’t as scary, and Sept. 11, 2001, is on its way to joining Dec. 7, 1941 — more historical, less raw. Yet it’s also unsettling that the day is losing its power to make Americans pause. This is part of the general amnesia that led Mitt Romney to deliver his acceptance speech for the Republican presidential nomination without mentioning a country called Afghanistan." Having myself lived through that infamous day in New York City exactly 11 years ago today, its annual recurrence elicits a combination of responses. There is, first of all, the memory of those who were lost - in particular for me, two St. Paul's parishioners. Remembering those who have died is a duty incument upon the living - always and everywhere. Then there is the memory of the event - the "rawness" of it, to use Milbank's image - the transformation of a beautiful blue September sky into a darkened, frightening one, the days of anxiety followed by weeks of funerals.Finally, there is the attack's long-term impact on our country and the world. Memorializing, especially when focused on remembering vicitms more than the event itself and its larger public significance, necessarily has its limits; and nothing highlights those limits more than the inevitable passage of time. We can - and to some extent we must - "move on" even while not forgetting. We may mourn forever, but we mourn differently now than then. That's the way life is. As for the significance of the event, the question then becomes whether it still retains the same significance for us today. Pearl Harbor, after all, had a very specific significance for Americans for the duration of Wold War II. With that war won, its significance necessarily changed, becoming more a matter of historical memory and possible lessons to be learned. But what lessons? To me, one lesson is certainly how we can never adequately anticipate what we don't expect. In restrospect, it's easy to say that America should have expected a Japanese attack in 1841 and a terrrorist attack in 2001.But it's hard to read the signs the same way before the fact. Until something like that actually happens it's hard to imagine - let alone anticipate or plan for - what is still unimaginable. That is why in each of those instances so much of the after-the-fact blame-game misses the point. Once such an event has happened, one may draw all sorts of lessons for future preparedness. But it probably makes little sense - and gets in the way of present and future preparedness - to waste energy looking backward. The most important legacy of 9/11 remains the two wars which we have fought since then and the changed way we now look at our dangerous world. Here, however, we have experienced a weird disconnect. The four wars which the U.S. fought in the 20th century were all fought with conscript armies, and thus broadly impacted the entire society. Not so our post 9/11 wars. Defending one's country militarily used to be seen as an expectaiton of citizenship. (See, for example, Aristotle, Politics, III, vii). Now militrary service is just one possible career option, and our national wars are fought with minimal impact on those who have chosen to pursue other options. Even our national economic policies reflect this weird disconnect. As Matt Miller observed, also in this morning's Washington Post, "In a saner era, the big 2001 Bush tax cuts enacted a few months before September 11 would have been immediately revisited, because we were now a nation at war." The fact that no such thing happened remains radically revealing about the kind of country and nation we have become, in spite of 9/11. After listening to Edward VIII's post-abdication broadcast in December 1936 (in which he famously explained his behavior because of his need for "the help and support of the woman I love"), one commentator is supposed to have remarked something to the effect that it was odd to hear a king speaking the language of romance magazines. Technically, of course, he was already an ex-king by then, but the point certainly still applies – and one I kept recalling during the recent political convention love-fest, at which speaker after speaker seemed to feel the need to begin by referencing his love for his wife (or her love for her husband). Of course, it's generally a good thing that people love their spouses. And, on balance, I think we are better off as a nation the more that people do so - and in particular the more that those in positions of power do so. My problem is not with the love, but with the talk, and with how what in 1936 still clearly belonged to "the language of romance magazines" suddenly seems to have almost taken over our public political language. A week or so ago, I commented on a recent biography about two really great mid-20th-century Presidents, Harry Truman and Dwight Eisenhower - contrasting them to the caliber of leaders we have been producing in recent decades. I think that their example is also eminently relevant to the point at issue. Anyone who knows anything about Truman, for example, knows how faithfully and deeply devoted he was to the love of his life, Bess Truman. But can anyone seriously imagine him beginning a major political speech professing his love for her? Of course not! It probably wouldn't even have occurred to him to do so. Obviously, that's not because he didn't love Bess, but because such private sentimentality simply didn't belong in the public square; and, if the question had been asked most people at the time would certainly would have agreed that it didn't. (It may not be an accident that by far the best address at the Democratic Convention, Bill Clinton's, also stuck to substance and largely avoided "the language of romance magazines"). In part, I suppose, all this may be just another example of the empathetic sentimentality that has so noticeably taken the place of rational discussion in so many important areas of life - even including moral decision-making. To some extent, I guess, it is also part of our overall obsession to "humanize" our public figures. Inevitably perhaps in a politics based on popular elections, there is a perennial tension between aristocratic and democratic criteria. We want our leaders to be the best. I certainly don't want someone like me running the country. On the contrary, I want someone smarter and better prepared than I could ever hope to be. But I also want someone who can understand me and my values. So, yes, we want to choose the best and the brightest, but within that group we'll pick an Eisenhower over a MacArthur any time. An unabashed aristocrat - an FDR or a George H.W. Bush - may merit the nod (four times in FDR's case), but such an aristocratic figure's long-term effectiveness and shorter-term prospects for success significantly depend on his personal ability to evidence a real comprehension of and respect for ordinary citizens and their values. And in that regard, FDR, without ever pretending to be anything but an aristocrat, succeeded very well. So, like loving one's wife, empathy is not a bad thing. In fact it's a good thing and somewhat necessary for successful leadership. But what happens when it becomes the center of the conversation and crowds out other fundamental dimensions of leadership? When a baby is baptized, after the actual baptism itself come a series of so-called “explanatory rites” – rituals that symbolically explain more fully the complete meaning of baptism. The last of these “explanatory rites” is called the Ephphatha - the Aramaic word Jesus used in today’s Gospel [Mark 7:31-37]. The fact that the actual word was remembered and repeated in its original language in the Gospel suggests that what Jesus said and did on that occasion must have made quite a memorable impression on his followers! At a Baptism, in imitation of Jesus, the priest (or deacon) touches the newly baptized baby’s ears and mouth, saying: The Lord Jesus made the deaf hear and the mute speak. May he soon touch your ears to receive his word, and your mouth to proclaim his faith, to the praise and glory of God the Father.” In other words, Baptism initiates a person into a new way of life - opening one’s ears to hear God’s word and one’s mouth to proclaim his faith – a new way of life for the rest of one’s life, just as the life of the man Jesus healed in today’s Gospel was totally and irrevocably transformed. Who was this man, forever immortalized by Jesus’ healing touch that day? Apart from his disability, we know nothing about him. He could have been anyone. He could, in short, be you or me. If anything, his anonymous status makes him a sort of “Everyman” character – further reinforced by the only other thing we can guess about him, suggested by the geography lesson at the beginning of the story. Jesus left the district of Tyre and went into the district of the Decapolis. Here, Jesus has gone beyond the borders of Israel into unambiguously Gentile territory. The salvation promised by God to Israel in the words of the prophet Isaiah - Then will the ears of the deaf be cleared; then the tongue of the mute will sing – is coming true. And one of the first to benefit is a deaf Gentile, his ears suddenly opened to hear God’s word, a pagan, his mouth now opened to proclaim his faith! The story highlights not just the man and the miracle, but (significantly) what happened next. The man spoke plainly. The people were astonished and proclaimed it. Sometimes astonishment has a silencing effect on people. In this case, however, it led directly to action. The people proclaimed the good news. So this is a story about change – not just the dramatic healing of one individual in need, but the total transformation of his life and the creation of a community of disciples who have suddenly seen something new and different made possible by Christ. So what might such a transformed way of life and such a transformational community actually look life? The letter of James, from which we are reading these several Sundays until the end of September, reminds us that our faith must not be something somehow incidental in our lives, but must be transformative in every aspect of life. The exhortation we heard last week, Be doers of the word and not hearers only, deluding yourselves, gets “unpacked” in a series of practical exhortations today [James 2:1-5] to judge, value, and treat people according to completely new and different criteria from those predominating in secular society – a tall order, to be sure, in any time and place, and certainly in a society such as ours where we all seem so enamored with the rich and famous, a society in which the average CEO earns several hundred times what his or her average worker earns, fostering an economic, cultural, and moral gap of a magnitude that would have been almost unimaginable as recently as 50 years ago. As members of Christ’s Church, who receive his word and proclaim his faith, we are now witnesses of the change God is effecting in us – and through us in the world. Like the bystanders in the Gospel, we will have no viable authentic alternative but to proclaim what we have heard and seen, something we do in fact by becoming something new, by becoming new people, something that should show – must show – in our behavior towards one another. As the letter of James illustrates, that is a challenge in any time & place. And it is, if anything, that much more so in an anxiety-ridden, individualized society of narrow niche markets such as ours. The same Jesus is present among us today in his Church to open our ears and mouths. What we proclaim here on Sunday is intended to be proclaimed all week, every week, in our own words and actions and in all aspects of our lives. As Saint James’s challenging examples illustrate, God’s presence and action in our here and now life together is intended to be every bit as transformative & permanent in its effect on us and in our world, as that unforgettable Ephphatha was for that anonymous 1st-century “Everyman” in the district of the Decapolis. 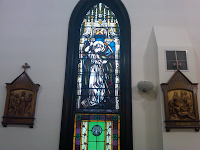 Homily for the 23rd Sunday in Ordinary Time, Immaculate Conception Church, Knoxville, TN, September 9, 2012. The 1st Reading in this past Thursday's Office was taken from the famous “letter” sent by the prophet Jeremiah to the Jewish exiles in Babylon. In that “letter,” the Lord, speaking through Jeremiah said to the exiles: Build houses to dwell in; plant gardens, and eat their fruits. Take wives and beget sons and daughters; find wives for your sons and give your daughters husbands, so that they may bear sons and daughters. There you must increase in number, not decrease. Promote the welfare of the city to which I have exiled you; pray for it to the Lord, for upon its welfare depends your own [Jeremiah 29:5-7]. To me this has always been a particularly powerful passage. Obviously, the exiles were meant to continue thinking of Jerusalem as in some ultimate sense their home and highest loyalty - much as we, their spiritual heirs, are intended to think of heaven as our ultimate home and our citizenship in the kingdom of God as our highest loyalty. In the meantime, however, the exiles were instructed to put down roots in Babylon, to settle down there for the long haul, to invest in the human city of which they had become a part, for upon its welfare depends your own. And so it is supposed to be for us, simultaneously citizens of the kingdom of God and citizens of our earthly nation. Citizenship is a complex reality, but it is based, as Jeremiah's letter illustrates, on a fundamental commonality of human experience - the benefits and burdens we share together as a people, and the corresponding commitments and obligations we acknowledge toward one another in society, for upon its welfare depends our own. Since the 17th and 18th centuries, however, philosophers and economists and ideologues have crafted an amazingly convincing alternative to this fundamental understanding of society that we are all in it together, that upon its welfare depends our own. And the appeal of the individualist alternative has been amplified, most convincingly, by its unarguable success at producing a materially better world. Probably no one has ever celebrated the material accomplishments of modern capitalism as effusively as Karl Marx, who famously praised it in 1848 for having "created more massive and colossal productive forces than have all preceding generations together. Subjection of Nature’s forces to man, machinery, application of chemistry to industry and agriculture, steam-navigation, railways, electric telegraphs, clearing of whole continents for cultivation, canalisation of rivers, whole populations conjured out of the ground — what earlier century had even a presentiment that such productive forces slumbered in the lap of social labour?" Indeed, as 20th-century development transformed workers into consumers (contrary to the predictions of Marx and the expectations of his disciples), the economic uplift produced by modern economic development provided the world with an amazingly diffusion of prosperity - and ever widening possibilities for prosperity - which the world rightly welcomes but which have also served to strengthen various versions of the individualist case. Of course, this material transformation of the world has come at an enormous social and spiritual price. Again Marx expressed it better than most: "Constant revolutionising of production, uninterrupted disturbance of all social conditions, everlasting uncertainty and agitation distinguish the bourgeois epoch from all earlier ones. All fixed, fast-frozen relations, with their train of ancient and venerable prejudices and opinions, are swept away, all new-formed ones become antiquated before they can ossify. All that is solid melts into air, all that is holy is profaned, and man is at last compelled to face with sober senses his real conditions of life, and his relations with his kind." For Marx, of course, this social and spiritual collapse was the necessary condition for historical progress - a destructive concept still very much alive in the popular contemporary mantra about "being on the right side of history." Admittedly, it's hard to stay faithful to the social and spiritual dimensions of human nature if that means being perceived to be on the wrong side of history - the losing side, so to speak, not just in a battle today, but for ever. Hence, the prophetic biblical assertion of a longer view of history in which Babylon's welfare ultimately reinforces Jerusalem's. That longer view, however, has to incorporate the lessons short-term present-tense experience. In exceptionally challenging times such as ours, when the deleterious consequences of an individualist ideology have become so much more glaringly evident, the advantages of taking our common citizenship seriously again may become more evident. But in our privatized understanding of the world, that will take a lot of re-learning. No, I don't mean the Republicans last week and the Democrats this week. I mean the two simultaneous Democratic Conventions I feel I have been watching the past two nights. On the one hand, there is the convnetion I tuned in to see - that of the Democratic Party I grew up with, the party of the "Middle Class" and working people, talking back to the proponents of government of, b y, and for the 1%. Lots of speakers stood up representing that party - among them Governor Deval Patricj (representing Massachussets after Romney), Mayor Julian Castro (Texan Latino rising star and presumptive antidote to Marco Rubio), Rist Lady Michell Obama, and President Bill Clinton. There was even a Catholic Sister - one of the so-called "Nuns on the Bus" - who gave a surprisingly effective speech (and might well have made a better warm-up act for Bill Cinton than Elizabeth Warren did). But then there was that other convention of what might almost have been another party. There were times - too many times - when I felt the channel had changed itself somehow and was covering a NOW convention. Certianly it sounded at times as if the party was about nothing but abortion (and contraception). One media commentator suggested we were actually watching a base-oriented conventionf rom 7:00 to 10:00 and then a more mainstream-oriented convention after 10. Even then the abortion-obsessed anti-life agenda usually got itself an obligatory endorsement even from most of the after-10 speakers. The conspicuous exception was Bill Clinton. Having successfully taught an earlier generaiton of Democrats how to reconnect with the mainstream (and thus win elections), he apparently was trying to do the same again last night. Unless I missed something, I don't think that the two liberal pseudo sacrametns of abortion and contraception were evenmentioned by him. The dangerous dichotomy between two simultaneous conventions of two souls cohabiting the same party's body showed up in the unexpected platform battle. Back when conventions actually mattered, platform battles made much more sense. Now that conventions ar ejust party commercials, platforms are pretty pointless. A platform battle is at most an enetrtainign sideshow - but in this case at least a revealign one nonetheless. The presenting problem was that a change had been engineered replaacing the platform's traditional language about Jerusalem as Israel's capital and p[eople's God-given potential. People don't normally pay much attention to platform language - except when someone deliberately changes it! So the radical changes in the platform rightly got noticed - and attacked. Apparently, the President himself had to get involved to fix things and restore the traditional language. It could have easily ended there - an embarassing episode soon to be forgotten. But the diehard supporters of the change now being undone were determined to create an embarassing spectacle, which they did in a voice vote, forcing the Chair to make a parliamentary ruling that contradicted what everyone in the hall - and watching on TV - had heard. As Bill Clinton illustrated in his speech, the path to victory lies in reviving Americna community, not in the niche markets of secularist identity politics. So, in which of these two directions will the President propose to take American tonight?